There are so many decisions involved with building or remodeling a home. From windows and doors to shingles and siding, the plethora of options to consider both inside and outside can be overwhelming. One choice can be simple—windows. As the pitfalls of traditional wood-framed windows have become more apparent over the years, manufacturers have developed desirable alternatives, most made from vinyl or fiberglass. So, how to choose between the two? A simple apples-to-apples comparison will clearly show, while fiberglass is more expensive, the advantages are clear. Get a full breakdown below of how fiberglass stacks up against vinyl, proving superiority is well worth the investment. Aesthetic Appeal – Fiberglass and vinyl window frames are designed to emulate the beauty of traditional wood windows. Both offer an array of color and style options, but Fiberglass tends to offer more traditional-looking frames and vinyl can appear bulky with unsightly welded corners. Fiberglass also maintains a solid appearance that’s resistant to scratching, chipping or fading. Expansion/Contraction – As the temperature and pressure fluctuates through the seasons, materials in your home are susceptible to warping or reshaping. Fiberglass expands and contracts 833% less than vinyl, helping to guarantee a perfect fit during and after installation. Softening or weakening due to heat exposure, known as “off-gassing”, is a common problem associated with vinyl. Fiberglass can handle temperatures up to 350 degrees without distortion, keeping the window stable and weathertight. 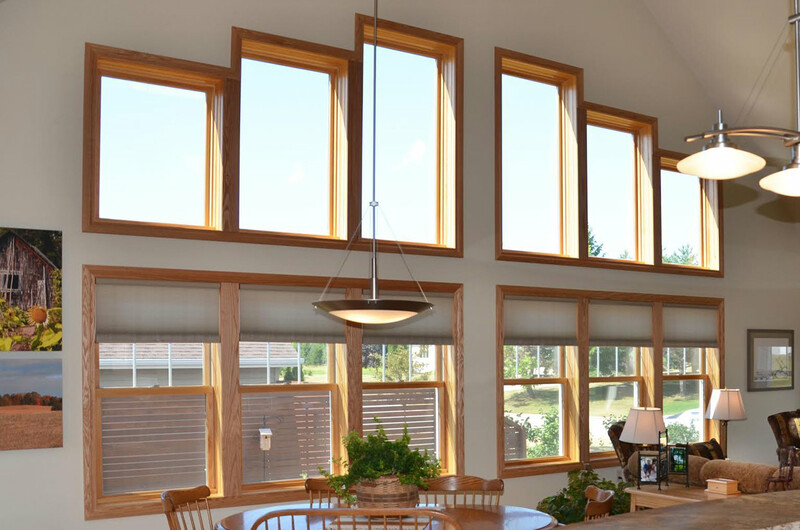 Energy Efficiency – Because fiberglass windows are guaranteed to remain weathertight, there is a lower risk of seal failures or air leakage in your home. With better insulation than vinyl or wood, fiberglass windows can help to reduce energy bills and increase the comfort level in your home. Durability – The acrylic finish used on fiberglass frames is thicker than competitors and resists UV degradation five times longer than vinyl. Fiberglass windows also are up to eight times stronger and have a 38% longer lifespan than vinyl windows. We feel Marvin Windows and Doors are the best choice for fiberglass options. Stop into Van’s Building Center to view our Marvin Windows display and learn more!